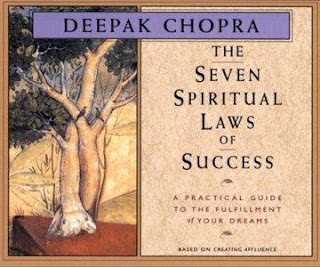 Deepak Chopra's written a lot of books, given a lot of talks, and he tweets a lot, too. He's an active purveyor of the secrets of Abundance (aka, success, wealth, and happiness). Before he became this guru, however, he was a long time student of Maharishi Mahesh Yogi, better known as the dude who started Transcendental Meditation. And he was once a doctor, too, although since he's acquired so much Abundance, I doubt he practices medicine anymore. According to his website, Dr. Deepak Chopra has written over 60 books. I've read one, The Seven Spiritual Laws of Success, which turned out to be a condensed version of a different book of his, so I feel totally confident that I have a full understanding of his teachings. Which I will pass along to you, my tens of readers. Why? Well, I actually found his book quite compelling. I'd have to characterize it as Buddhism Lite--or Hinduism Lite, since he was born in Delhi, or was it New Delhi? Or maybe it's just New Age. Anyway, at the very least it's well-written, even if he does crib from Florence Scovel Shinn. Underneath it all, we are pure consciousness or "pure potentiality,"
so if we get in touch with that universal energy, we can channel it for our purposes. This is pretty clear. Have to give to get. Give and take keeps abundance circulating. And, the kicker--you have to give what you want to receive. So, you want money? Got to give to get, baby. Karma, or cause and effect. Your choices affect you and those around you, so make them for their benefit as well as your own and you create good karma. What to do if you've inherited a lot of bad luck (karma)? Well, learn from the bad stuff and try to make good choices as mentioned in previous sentence, so that you nullify the bad effects of previous bad, um, effects. Meaning to stop struggling against yourself or the world. When you live "in harmony," your efforts flow and so does good old abundance. I've talked about this in a previous post. The idea is you plant your seed of intention in your mind (in your pure consciousness, that is), and let it sprout and bloom. This is right out of Buddhist dharma talks I've read in Thich Nat Han and others: that our minds possess the seeds of all possible emotions, and that the ones we water with our attention are the ones that grow. So if you're all negative and grumpy and water those seeds, you develop your negativity and grumpiness; but if you cultivate happiness and gratitude, then, well then you become an annoying Pollyanna. But I've seen that movie, and really, she was so hard to take, because life really laid the s**t on her. This is actually also very fundamental to Buddhism. It means here that you plant your seed of your intent: for success at whatever your endeavor is--and then you let go of trying to control the way it comes about. No micro-managing allowed. You must plant your wish, then allow it to come to fruition at the right time in the right way. Breathe. Dharma. Which here means purpose in life. Which here means that once you listen to your true self (how to do that follows) and discover what your unique talent is, you pursue that. And according to Deepak Chopra, we each have a special and unique something. So we find that something, and align it with our deepest wish. And all will be well and abundance will flow. Wait, I forgot to mention one thing: this dharma has to be used in service to others in order to create real abundance in your life. Wow. that's a lot of info there, my tens of readers. And I didn't even get to it all. Like how to implement these laws. Phew. Tune in next time, when I add my three cents to my two cents. And get: Abundcents. I love this rundown. There's a lot of wisdom there to take in. Good stuff! Thank you! I really enjoyed the book. More on that coming soon. Rock on lady. Abundcents. Love it!